In April 2007, the RSPCA revealed that its workload had increased by 50%. In April 2015, the RSPCA states a rise to 160,000 cases investigated, a rise of 9000 over 2 years. So much for a better deal for animals. The fact is, the Hunting Act is fundamentally flawed, not just because it ignores the unique scenting power of the dog in a wildlife management process, but because it also ignores the crucial fact that other activities will inevitably fill the vacuum, using methods that cannot possibly replicate the benefits of using dogs. Hunting is selective (through scent), testing (via the chase) and has no chance to wound (the quarry is either killed or escapes unscathed); no other method of control can make that claim. This is what is so ridiculous about the argument that because the baiting ‘sports’ have been banned, a hunting ban is the next obvious step. The two are worlds apart, as the foxhunting founder of the RSPCA, Richard Martin, forcefully explained at a time when he championed the first animal welfare law in 1822. A cursory examination of the Hunting Act reveals how illogical and unprincipled this legislation is, yet many people will never bother to read it. It is no bad thing to encourage everyone to view this law via the internet and ask if they can point to a shred of principle or logic contained within it. If they would like a simplified list, see the attached. 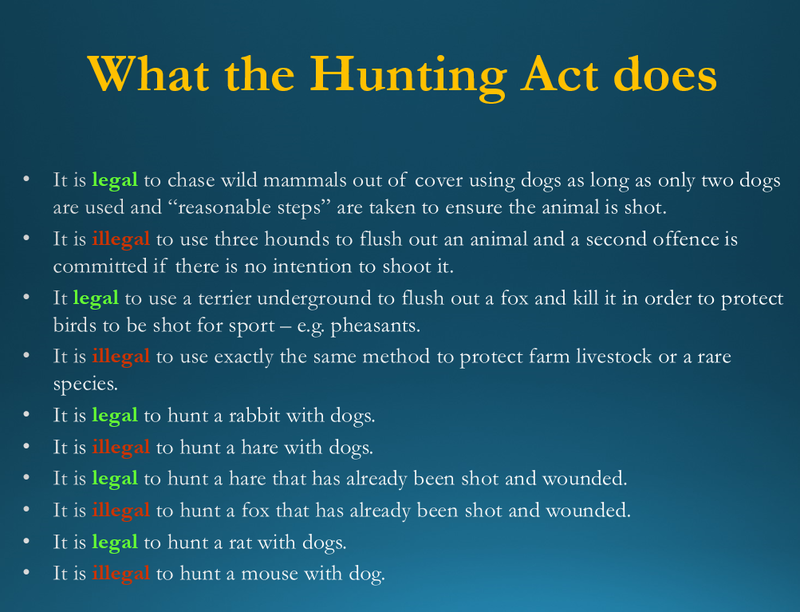 What is clear, however, is the fact that the law does not do what the anti-hunting groups thought it would and is a perfect example of ill-conceived legislation. The inadequacies of this law started to become apparent almost immediately causing a great deal of frustration amongst anti-hunting groups. That frustration continues to this day, as seen by the rise of hunt sabotage activity which often slides into violence. Some crucial points must be made here. Firstly, when this Act was passed, and for some years afterwards, it was claimed that the legislation (and indeed its Scottish equivalent) was perfect and that it was only those enforcing (or not enforcing) it who were at fault for its failures. Now the tune has changed and the flaws are admitted, but blamed on pro-hunting MPs and Peers putting down wrecking amendments when the law was being debated. This claim is completely groundless, as those opposed to hunting were in the majority both in the House of Commons and during the committee stage. Though Peers did try to amend the Act, their votes were overridden by the use of the Parliament Act. The resultant legislation, therefore, is entirely the product of the anti-hunt movement. Secondly, the anti-hunting groups seem to pick and choose their positions on various issues as and when it suits them. The attempt last year by the UK Government to amend the Hunting Act to bring it into line with the Protection of Wild Mammals (Scotland) Act 2002 (the Scottish hunting legislation) is a perfect example. Initially, the Scottish law was praised by the LACS, but when the change to the flushing exemption in the English and Welsh law was proposed suddenly the Scottish law was flawed. Thirdly, while anti-hunting claims and accusations have hardly changed over decades, the arguments in favour of hunting with hounds have strengthened, supported by a better understanding of hunting and the science behind it. It would be easy to make such a claim, but a good indication of its validity is the fact that in schools, colleges and clubs up and down the country, talks on hunting are welcomed. Presentations on wildlife management and the role hunting with hounds plays in that process, are particularly well received in veterinary schools. It raises the obvious question, why would young people, who have dedicated their lives to animal welfare, accept that hunting was justified unless they could see its value? This is where the nonsense of the antis’ “vast majority of the public is against hunting” argument falls down. Ask a simple or stupid question in a public opinion poll and you’ll get a simple or stupid answer. And in any case, we do not run the country on the basis of opinion poll results. It is important to understand that while things appear to have stalled on the repeal front, there is much work going on behind the scenes to bring an end to the Hunting Act - legislation that has been strongly criticised by many people totally unconnected to hunting, including legal experts, the police, veterinarians, senior civil servants and the Prime Minister at its time of coming into law, Tony Blair. The road to repeal may be longer than hoped, but the stages are clear. Much depends on what is politically achievable at any given time. Many now think that the best way forward is ‘repeal and replace’. This may mean amending the Hunting Act in the short term to allow for the agreed exemptions to work as intended. Then, when the time is politically right, removing the Hunting Act and replacing it with a genuine animal welfare law covering all wild mammals, but with offences and convictions based on sound evidence, not opinion or prejudice. Just such a proposal has come from Labour Peer Lord Donoughue and his draft Bill, though not yet published, is certainly something everyone concerned about animal welfare should support. Repeal alone simply means that hunting remains as some kind of political pawn, to be used as and when a hostile government wants to stir up its backbenchers. Back in 1996, the League Against Cruel Sports proudly boasted about a hunting ban, “Within a couple of months it would all be over and everyone would wonder what all the fuss was about.”, yet here we are eleven years later and the issue is still as alive as it ever was. One of many LACS’ prediction that came to nothing, just as the Hunting Act has done nothing for animal welfare.